Simultaneously heartfelt and amusing, you would be hard pressed to find a film more charming than Philomena this year. This is hardly surprising when you have the wit of a screenplay penned by Steve Coogan and the acting might of Dame Judi Dench involved. Stephen Frears' film tackles the true story of Philomena Lee (Dench) - an Irish woman who teams up with political advisor turned-journalist, Martin Sixsmith (Coogan), to track down her long lost son who was put up for adoption by her convent. 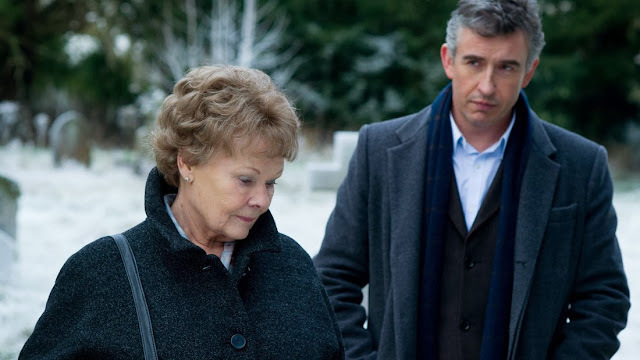 Frears directs Philomena with a warm sense of hopefulness which remains throughout this quietly uplifting film. Coogan and Jeff Pope's screenplay takes us in a number of directions, interacting with a huge spectrum of human emotions - from initial hopefulness to crushing disappointment which builds to a somewhat angry and subsequently uplifting conclusion. Focused performances from Dench and Coogan ensure that every twist and turn of this screenplay finds its way to the audience with Philomena inspiring, amusing, and on more than a few occasions tugging at the heartstrings. The odd-couple dynamic makes for an amusing and occasionally difficult watch. The sweet (yet surprisingly aware) Philomena's relationship with the cynical Oxford educated Sixsmith is often endearing, and ultimately heart-warming. This is showcased mainly through Sixsmith's slight transformation as a character (who is originally horrified by the prospect of working on a human interested story for the "weak minded and easily manipulated"), yet grows to have a very deep personal involvement in Philomena's case. Dench is truly sublime as Philomena. Seeing the character's optimism and hope being shaken as she delves into the past has the emotional weight of a ton of bricks. Dench remains charming and downright loveable, whilst showcasing just exactly why she's a national treasure. The actress can convey a tremendous emotion and tragedy in the smallest of glances or gestures, whilst also getting plenty of opportunities to show off an impressive comic streak. Coogan is given the chance to remind us that he is a solid dramatic actor (just as he did in What Maisie Knew, earlier in the year) delivering a far more understated and emotionally low-key performance to that of Dench. Philomena is understated yet tremendously powerful, thanks to a touching and effortlessly amusing screenplay from Coogan and Pope. Frears directs with an endearing optimism whilst Dench and Coogan make for a tremendously watchable on-screen double act.